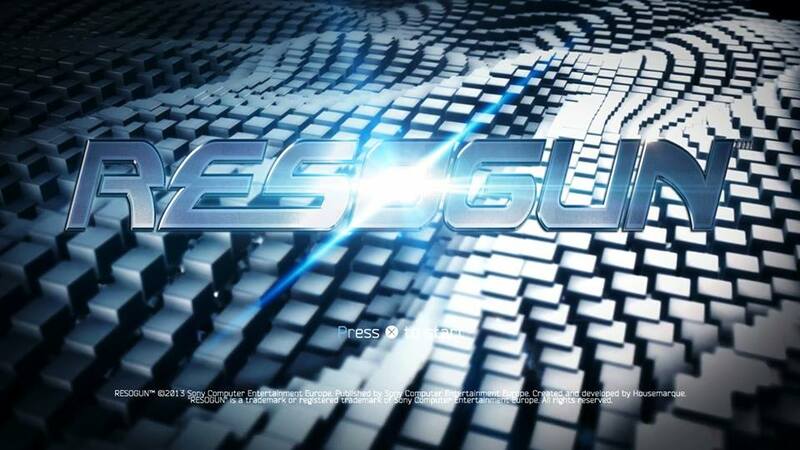 Genre: Horizontal-scrolling shoot 'em up. The core roots of this invigorating blast of fresh air come from the great-great-grandfather of shooters, namely Williams’ Defender, as many of the concepts implemented in this classic come into the mix, with an added dusting of 21st century gaming pizzazz and zing. As expected with a futuristic setting, the desolate and dystopian citadels from which you are tasked to save the last humans are typically recognisable, but also utterly and wonderfully envisaged. Each of the 5 stages, split into 3 phases, have a differing feel and mood, but all are equally visually stunning and daunting to conquer. 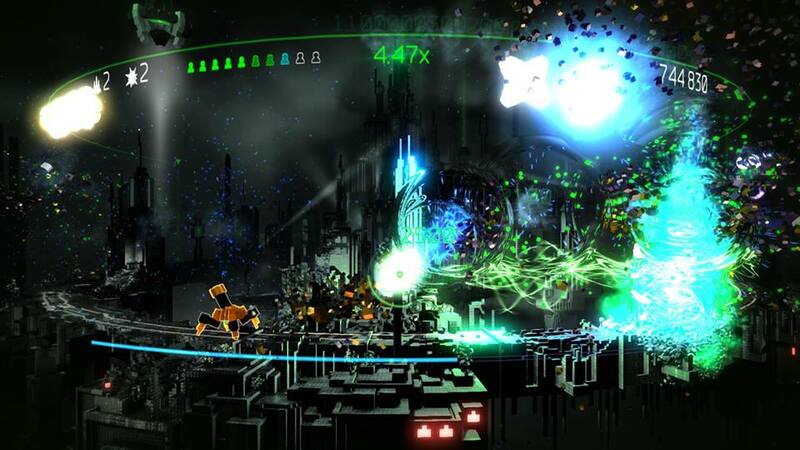 A graphical method is employed here to provide this environment with body and a unique physical state, namely that all the foreground objects, sprites and humans are created using millions of tiny blocks, that when destroyed fall, splay and scatter away with alarming realism. This is called a voxel technique, and not only marks Resogun out from other shooters, but also effortlessly moulds a world which feels like it’s living and breathing. Backgrounds are also rendered and designed spectacularly, adding that individual feel to each stage and providing a backdrop to gawp over. However, it is in no way distracting from the foreground action, as whilst the colour palette can appear too dark and samey, it pulls off a trick with clever lighting to make everything appear authentic, pronounced and distinctive. Never will you loose your craft or miss an incoming enemy due to it vanishing into the background. Destruction sequences of attacking ships and structures are brief and to the point, making sure any distraction is limited, and again blends seamlessly into the whole experience, putting a full stop on the terrifically designed mechanics. 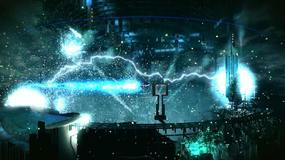 Many gameplay attributes are expertly merged together to make the missions explosive, exciting and challenging. 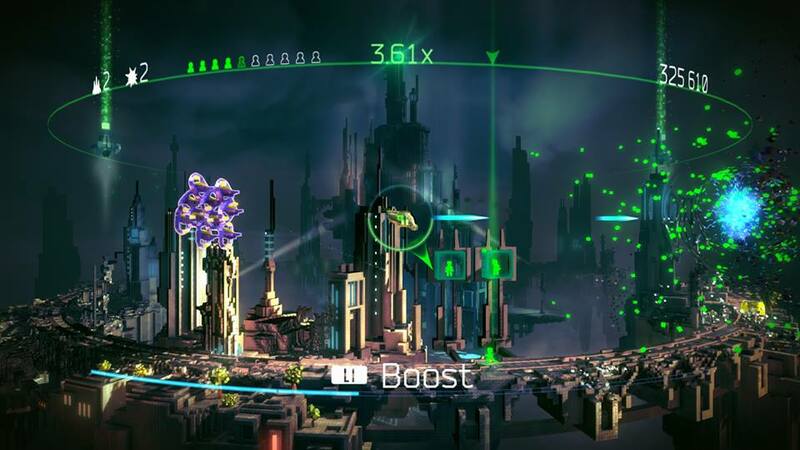 Fire and forget is not an option here, as careful planning, positioning and foresight is required to achieve success in Resogun. One of the aspects that make this possible is the cylindrical flight-path and two-way heading you have around each city. This enables you to change direction on a whim, look into the distance for that trail of ‘keeper’ enemies, or spot a ship looking to kidnap a released human, and reach them before all is lost. Tactics play a vital role here in all aspects of play, and even more important when facing the stages bosses, which are predictably but pleasingly epic in design and fear of threat. 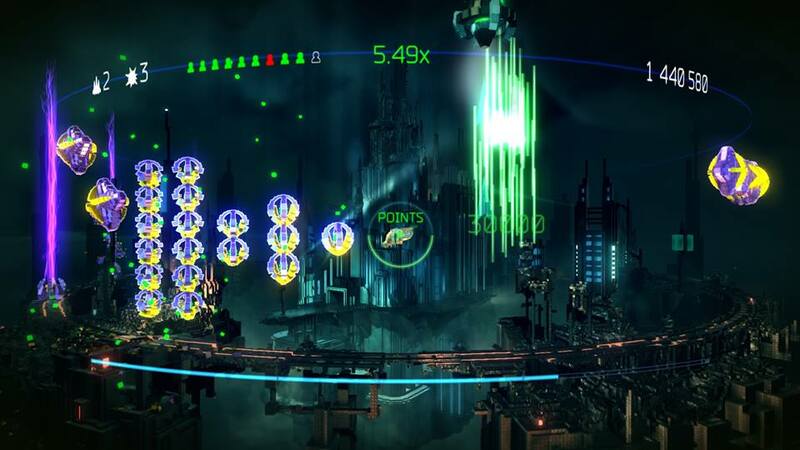 With the ability to use an all destroying ‘bomb’ which clears the entire playing area, charging the ‘overdrive’ weapon for short devastating stints or speed boasts to reach a point quickly, there is a lot to think about at any ne time other than simply blasting the millions of baddies away at first sight. Above all, saving the 10 humans in each stage is vital, which is no simple matter. To release them you have to destroy a designated hoard of glowing enemy ships, and then you have to pick them up and place them in a hovering transporter beam, all the while avoiding the constant barrage of fire and alien craft hell-bent on picking up said humans themselves. Indeed, much like the landers from Defender. 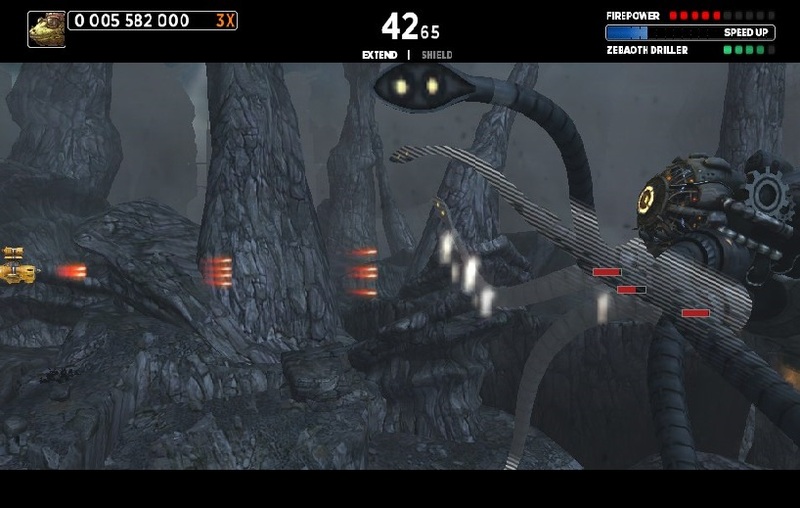 You have the amusing ability to throw the humans around, gaining extra points for enemy evasion in the process. Before you know it, the next human needs saving, adding to the myriad of things you are already trying to accomplish. Oh, and I didn’t mention that reaching a high score is vitally tied to you keeping the multiplier meter ticking too by constantly hitting targets. This sounds extremely complex doesn’t it? Well, it’s surprisingly rather easy to adapt to all this, helped by the spawning patterns of the targets and quick acquisition of devastating power ups. 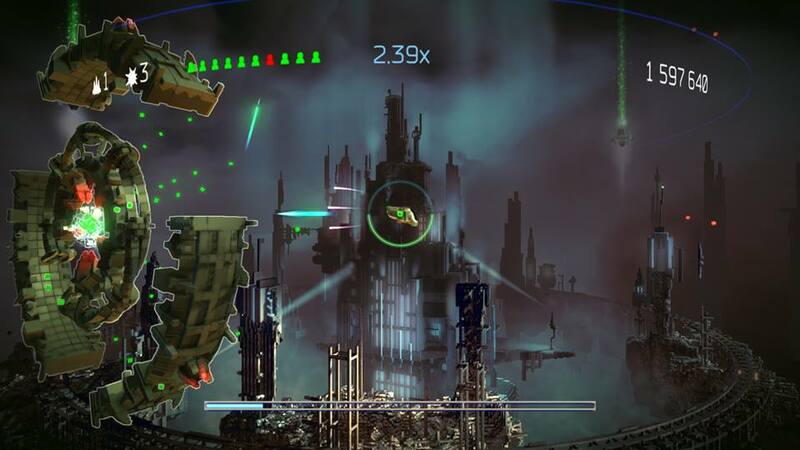 Standard firepower in Resogun doesn’t consist of over-the-top WMD’s like R-Type does; typical lasers are the weapon of choice in more of the Gradius ilk, which can be steadily upgraded to create a formidable attack. Also you have a choice of 3 ships from the start, the developers opting not to make any unlockable which is a good call. Each ship handles and performs very differently, so finding the right one to match your skill level is another challenge in itself. All these implementations make for an absorbing challenge which grows in pace and speed, finished off with a rewarding slow-mo sequence upon destruction of a stage boss. The control system of using both analog sticks may seem odd in a scrolling shooter, but again works extremely well and within minutes of playing you will wonder why this wasn’t always the case. Not to be left wanting in the quality stakes, the audio accompaniment is also truly awe-inspiring. Blockbuster sci-fi techno belts out during each stage with a striking switch to a meaner, bass-heavy toned boss music. This is all no surprise to the player however, once a few minutes of the dramatic Hans Zimmer style opening theme has been heard. Wonderful music as any self-respecting shooter should have. 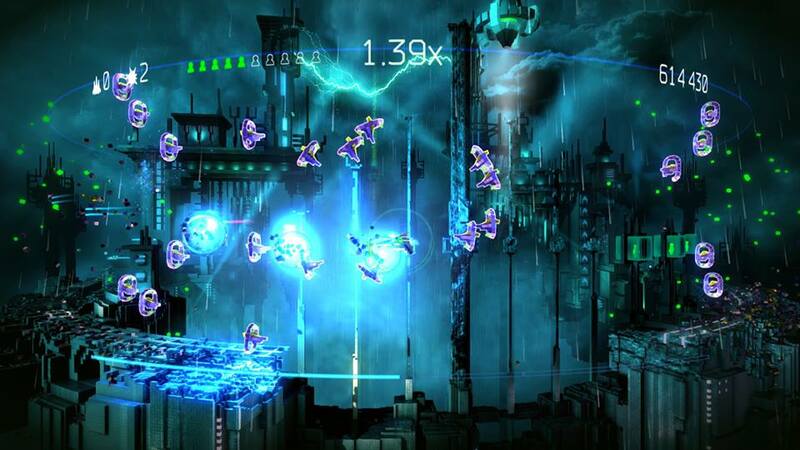 With jaw shaking explosions, weapon fire blasts, comical shouts of the humans and a superb computer voice assisting your missions, it’s a harmonic balance of goose-bumping chords, vivid SFX and outstanding visual immersion that really makes Resogun an exhilarating experience in tactile production. 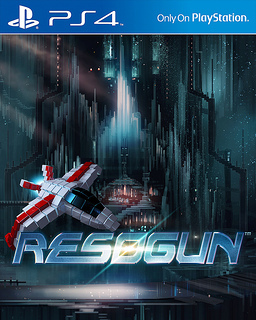 It may come as a bombshell to some, but the best release title for the PS4 was not a high-end FPS or Triple-A exclusive, it’s a small but extremely neatly put together indie game which sings the 2D shoot ‘em up song as loud as any other has before it. Verdict? Awesome.